How to feel better in 2019. Here are 8 ways to feel better and get 2019 off to a healthy start. Clinging to a multicolored wall 30 feet above the floor of High Point Climbing, I started to rethink my long-held belief that I am not afraid of heights. "I think the thing most newcomers to the sport experience are the mental barriers there are to climbing, like becoming comfortable at height. It's a full body workout and a puzzle. It combines mind and body at the same time," says general manager Tony Levy. Around me are a half dozen people who long ago surmounted their own mental barriers and who are scurrying up color-coded handholds and foot-steps that define different routes up the hulking 55-foot-tall wall. "We have a team of route setters who spend time meticulously setting up the hold types, the route, and putting them in specific orientations to create different levels of difficulty," Levy says. The red route I'm following is the easiest, and my safety is assured with an auto-billets which will slow any falls to survivable speed. High Point Climbing has only been open since December 17th, but it already has a loyal customer base. "I think the thing we try to develop most of all is the community. We want to create a place for people to come together and share a passion for climbing," Levy says. 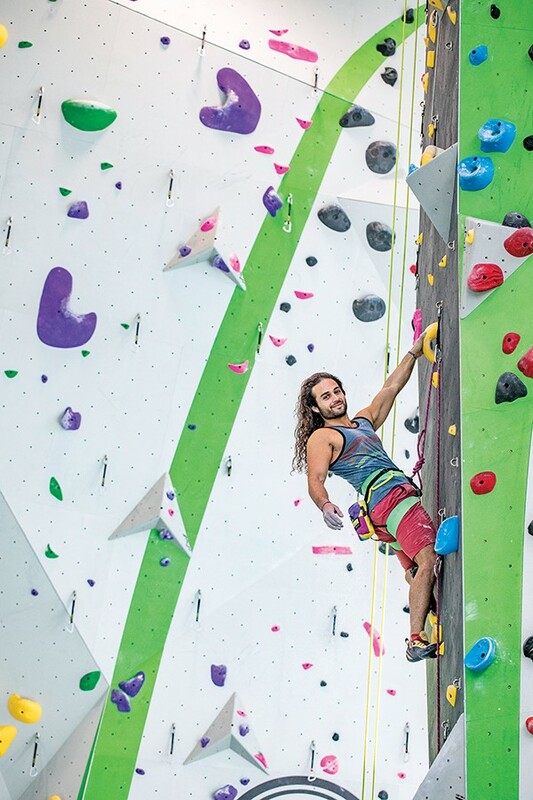 The 35,000-square-foot facility on Humphreys Boulevard is the fourth High Point Climbing location opened by owner John Wiygul, a native Memphian who got into the sport by building a climbing wall in his family's barn. The first two were in Chattanooga, a center for the sport of rock climbing, and a third was opened in Birmingham. In the short time High Point has been in operation here, they have discovered a pent-up demand in the flat land of Memphis for vertical workouts. "It's been super busy. With the holidays and kids being out of school, it's been wild," says marketing and sales coordinator Kendall Fowler. In addition to the climbing walls that range in difficulty from "I can do that" to "Oh my God!" there's a full gym and a yoga studio. In the Kid Zone, the intimidating walls are replaced with a skyline of padded skyscrapers, a giraffe, and a giant beanstalk. High Point Climbing will celebrate its grand opening on Wednesday, January 16th, with half-price guest passes and a ribbon cutting, followed by food trucks and refreshments. Levy says "zero experience is necessary." Greg Graber founded a groundbreaking meditation program at Lausanne, the first of its type in the deep South. He leads meditation sessions with the Memphis Grizzlies and the Memphis Tigers. Once a month, he's flown to Baton Rogue to work with LSU's basketball team. He's the author of Slow Your Roll: Mindfulness for Fast Times, available at local bookstores and on Amazon. But, at first, he was pretty meh on meditation. "I thought it was the worst thing in the world," he remembers. "Really esoteric and a little bit hippy dippy." But Graber ran ultramarathons and had read an article about how meditation could help. He says that meditation didn't take away the pain of the long run, but instead put him so in touch with his body that he was able to push himself both mentally and physically. Graber, who has been practicing meditation for about a dozen years, leads classes on Saturday mornings — Saturday Morning Unwind Session at 9:30 a.m. at Church Health Center. It's one of many of the free/open-to-the public mindfulness/meditation classes Church Health offers. During the Saturday class, Graber will generally lead the students through a three-minute silent meditation, having them focus on their breath. He then talks and follows that up with either a breathing or visualization exercise. "There's much more to good health than medical treatment," says Jenny Koltnow of Church Health. Koltnow says that meditation can be an essential part of well-being and the good thing is that it's accessible to all. "The powerful thing about mindfulness is that it affects different people in different ways," she says. Meditation has been shown to relieve stress, tamp down anxiety, and help with insomnia. It's good for pain management and is useful in beating addictions. Graber notes that the point of meditation is not clearing your mind of thoughts — that would be impossible. "Typically, psychologists tell us we have upwards of 70,000 thoughts in a 24-hour period, which comes to about 48 thoughts per minute. So, our minds are going to be all over the place. The objective is to refocus when your mind wanders," he says. In terms of wellness, Graber places meditation as a tool to mental health fitness. New therapeutic modes are constantly being researched, and practices accepted in other times and other, non-Western cultures, are under serious reconsideration. Acupuncture is one of these. While it's true that skepticism persists about the efficacy of having small needles inserted at strategic points of one's body — along what ancient Chinese practitioners of the art referred to as meridians — so as to mediate the nature and impact upon the self of chi, the life force, more people in our part of the world are seeking out the technique and reporting positive results. Several years ago, I had despaired of traditional medical regimens for dealing with what were then recurrent bouts of iritis, a severely painful inflammation of the eyes. The standard treatment was to immobilize the pupil by direct application of liquid cortisone and then wait out a reversal of what was thought to be one's over-active immune system. The acupuncturist I consulted, a gentleman of Korean origin and a pioneer of the art locally, had me lie on a treatment table while he inserted an array of tiny single-use needles at points near the affected eye(s) and elsewhere. Did it hurt? Well, not nearly as much as the iritis did. I could certainly feel the insertions, but, along with them, a kind of tingling, a not unpleasant "give" — enough to give me a sense that some energy field had in fact been engaged with. The bottom line was that the treatment seemed to work. The pain level of a condition I normally experienced as virtually intractable was significantly reduced almost immediately, and the inflammation itself cleared within a day or two. Placebo effect? I don't think so. I subsequently submitted to acupuncture on occasions related to specific ills and as a general tonic. I can't tell you exactly how it worked, but it worked. Though some insurance policies require that acupuncture be pursued in tandem with more conventional remedies, the actuarial folks seem increasingly to be regarding it as viable. All I can say is, it's worth a try. Preston Butts is a serial entrepreneur. One of his four businesses is the new Downtown Nutrition, which is a sister store to Nutrition Bar in East Memphis and Nutrition Hub in Germantown. Butts is currently working on opening another Nutrition store in Oxford, Mississippi. Butts lives Downtown with his wife and two small children. He quickly recognized that there were not a lot of healthy options. Nutrition Downtown had its grand opening last week. The Nutrition stores offer protein shakes in such indulgent flavors as apple pie, Snickers, Tootsie Pop (orange and chocolate), dulce de leche, and glazed donuts. All are under 200 calories. They also have energy teas and beauty and aloe shots, which can be put into the protein shake. Mental wellness plays a huge role in your overall ability to live a good life. Veronique Black, the office coordinator at the Memphis office of the National Alliance on Mental Illness (NAMI), says that mental health is as vital as physical health and should be addressed and maintained with the same urgency. "When your mental health is good, your overall quality of life automatically improves," Black says. "It can be the difference of just existing and actually enjoying life." NAMI, a grassroots, self-help organization, works to raise awareness about mental health and enhance the lives of people with mental health issues by providing free education, support, and resources for them and their families. NAMI offers issue-specific classes and support groups taught by either volunteer professionals or individuals who've lived with mental illness. Topics include depression, PTSD, eating disorders, anxiety, and others. Black says a large piece of what NAMI does is work to "eradicate the stigma" of mental illnesses so that one day they can be treated with the same dignity as other illnesses. "There's a lot of misconceptions surrounding mental illnesses," Black says. "That they are a result of a moral weakness or behavior defect is just not true. It's actually a brain malfunction and should be dealt with. Mental health issues are just like any other issue affecting the body." Mental illnesses are very common, Black says, citing that one in four people struggle from a mental health issue at some point in their life. "It's nothing to be ashamed of," Black says. "If you're in a room with 10 people, at least a couple of them will be struggling with a mental illness. Either directly or indirectly, it touches everyone at some point in life." Fear was easily the largest barrier to fitness for me in the beginning. I have always been more at home in a bar room than a weight room. But I always I knew I needed take care of my body, and it bothered me. How do I even do that? Will I have to give up all the things that make me ... me? I was unsure how to start and afraid of who I thought I'd have to become. I wasn't some gym-rat meathead or a "sporty" person. What's this called? How do I use it? Those were two questions I seemed to ask all the time in 2013, when I joined the Kroc Center. But the Kroc staff have always been helpful, patient, and, maybe most important, not judge-y. In fact, the whole place is not judge-y. That seems to be a big but unspoken mantra. Another thing I love abut the Kroc is that it looks like our community in there. All races and genders sweat together in the workout spaces, swim together in the pool, and cheer together at the basketball courts. Chances are you've seen ginger flowering in many a garden. But did you realize it was medicine? While we don't recommend digging up your neighbor's ornamentals whenever you have a stomach ache, edible varieties of ginger are easy to find at most grocery stores. Its cousin turmeric is a bit more rare, though local suppliers often have it. It's worth stocking up on both, as their value has been recognized in Ayurvedic medicine for centuries, and clinical trials have confirmed their efficacy in treating a number of ailments. Ginger has long been used to alleviate general nausea, motion sickness, morning sickness, and, more recently, post-surgical nausea and chemotherapy-induced nausea. The respected volume Prescription for Natural Healing also notes that it "cleanses the colon, reduces spasms and cramps, and stimulates circulation." Furthermore, clinical studies have proven its effectiveness as a pain killer; in one, ginger matched the performance of a combination of ibuprofen and prescription anti-inflammatories in reducing menstrual pain. The National Institutes of Health (NIH) recommends it for all of the above uses, as well as relief from rheumatoid arthritis and osteoarthritis. Turmeric, ginger's brilliant orange relative, may be even more powerful. Its principle active compound, curcumin, has been subject to many studies which largely confirm the efficacy of its traditional use as an anti-inflammatory. Often, however, such studies often use curcumin extracts with much more concentrated quantities of the compound than a turmeric root typically contains. Some dieticians recommend mixing it with black pepper, which facilitates absorption of the smaller amounts occurring naturally. The Prescription for Natural Healing also notes that turmeric protects the liver and lowers cholesterol. And HealthLine.com cites scientific studies confirming curcumin's power as an antioxidant, its ability to enhance production of brain hormones that fight neuro-degeneration, and even its power to "reduce the growth of cancerous cells in the laboratory and inhibit the growth of tumors in test animals." I did a "Dry January" a couple of years ago. Yeah, maybe it was fashionable at the time, but it was something I was eager to do. I mean, I'd never punched a cop while blackout drunk on Beale Street or anything. But I had enough shameovers and hangover food to float a boat. Drinking was (and is) the coin of the realm in my social network. It's what we did (and do). And I was afraid of that on my first Dry January. Would I hide away at home, twiddling my thumbs? The first time, yes, that's basically what happened. But my wife and I did a "Sober October" before the holidays, last year. Not only were we able to successfully manage parties and a wedding stone, cold sober, we had a ton of fun, too. I also found that sobriety is a time machine. I used all the extra time I would have spent on drinking and recovering from drinking to push a personal writing project over the finish line with surprising efficiency and a renewed optimism. Thanks, sobriety. All of this says nothing at all of a hangover's unique ability to tell me chili cheese Fritos are health food and that the gym will still be there tomorrow. You've decided you want to switch from your fried chicken-hamburger diet to something healthier, but you don't know where to begin. Jeff Lehr, co-author of Feed Your Soul: A Cookbook that Nourishes Body, Mind and Spirit, has some suggestions. He also served as chef and part-time gardener for the old La Montagne natural foods restaurant. "The easiest thing people can do or add to what they're doing is start buying frozen vegetables," he says. "Add vegetables and fruits to whatever you're doing." He says, "The best thing is to go to your farmers market and pick up whatever's in season and work that into your diet." Add dark, leafy vegetables to your diet. "It's one of the things people are missing. They eat their salads, but kale, for example, is a super foods nutrient." Cook a pot of whole grains, which takes from 20 to 45 minutes. "Quinoa is high in protein. Brown rice. Millet. Oatmeal. If you cook a pot of grain rice or quinoa, and cook a little extra for four or five days, you've got the makings for a quick salad, soup, or stir fry." And, he says, "Make a little time to prep something extra like a whole roasted chicken or a pot of grains or a pot of beans. Over time, you've got the makings for a really quick, easy meal that can come together in 5, 10 minutes." You can still eat hamburgers and fried chicken — in moderation, Lehr says. He recently indulged. "I had a Blue Bunny ice cream Turtle Bar. Chocolate-covered ice cream bars are just so good." Nine ways to transform your life in 2019!